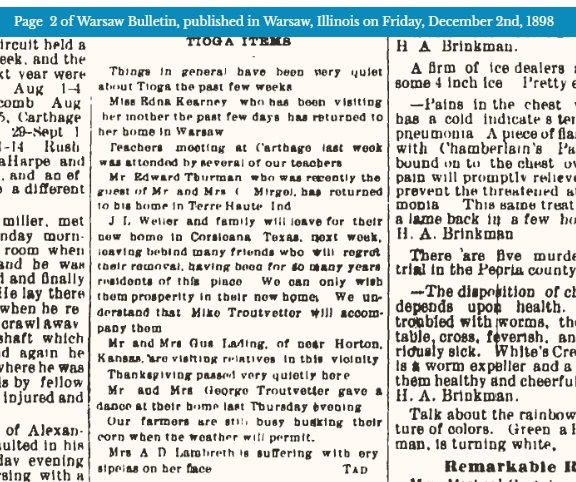 On 2 December 1898, the Warsaw Bulletin, published in Warsaw, Illinois, indicated that Mike Troutvetter[sic] was headed to Corsicana, Texas, accompanying J. L. Welier and family. The Weliers were “leav[ing] for their new home.” The reference did not specifically state that Trautvetter was making his new home in Texas–just that he was accompanying the Weliers on their trip. Trautvetter is enumerated in the 1900 census in Walker Township, Hancock County, which is where he was enumerated in 1870 and 1880, and 1910. It is possible that he lived in Texas a short time, but this reference does not provide evidence of any long term residence. Michael never sold the farm that he purchased in Walker Township twenty-some years before the 1898 reference to his Texas trip. The failure to sell the farm would not be proof that he never lived anywhere else–he could have rented out his farm to someone while he lived out of state. If he did live in Texas, census records suggest that it would only have been for a short time. The 2 December 1898 issue of the Bulletin indicated that Michael’s son George and his wife gave a dance in their home on Thursday evening. Whether that has any connection to Michael’s absence is not known.